Extend the power of SYSPRO to your warehouse floor. Automate inventory physical counts, purchase order receiving, job issues, inventory movements, sales order picking, and much more with riteSCAN Mobile Warehouse for SYSPRO™. Data entry is as easy as scanning a barcode. The advanced features of riteSCAN can virtually eliminate data entry errors such as shipping the wrong product or collecting erroneous cycle counts. Inventory quantities can be corrected right from the warehouse floor through Quantity Adjustments. Commercial grade real-time solutions labor tracking. With a quick scan, data flows from the point of entry directly to the SYSPRO ERP system. The transactions you process with riteSCAN are all completed in real-time. There are no expensive interfaces to configure and no need to wait for batch uploads at the end of the day. Built with Microsoft .NET Compact Framework (Wikipedia.org) for the Windows Mobile platform, riteSCAN is compatible with a broad range of handheld devices. In addition, riteSCAN works in a PC or Touchscreen environment. With so many choices, finding the right solution for your budget has never been easier. Special attention has been paid to developing a Graphical User Interface that is easy to learn and even easier to use. Most warehouse operators prefer an intuitive, uncluttered screen optimized for the tasks they perform. riteSCAN Mobile Warehouse for SYSPRO™ puts the “rite” data in the hands of the user without cramming the screen with information that only gets in the way of the general warehouse operator. Mobile barcode scanning technology is a cornerstone of streamlined supply chain management and warehouse systems. 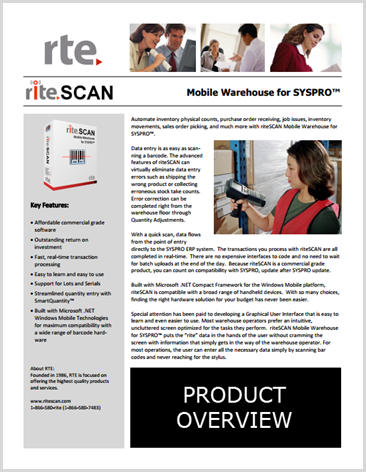 riteSCAN Mobile Warehouse for SYSPRO™, with SYPRO’s e.net technology, brings full-featured transaction processing to every corner of your warehouse. By automating procedures for employees, saving time, reducing errors and enabling real-time answers to customer inquiries, most companies discover riteSCAN barcode solution pays for itself in the first year. Get the riteSCAN product overview by completing the form. Get the Product Overview Now!